Granite Belt Support Services were recently successful in a Southern Downs Regional Council (SDRC) Fast Grant 2018 to be able to purchase 4 x I.T devices for staff use. GBSS staff provided with training on how to use these devices to assist with service delivery. We are very grateful to SDRC for the opportunity to apply and be successful with the application. This project has been assisted by Grants to Community funding from the Southern Downs Regional Council. Plenty of events to get involved in for 2018 Disability Action Week! We would love you to join us for what promises to be an enjoyable day! Crowdfunding campaign: Help us build our new building! Please support the construction of Stage 2 of the Granite Belt Support Services Inc Community Therapy, Activity and Training Centre. Disability Action Week 2018 celebrations, second week of September. An expression of interest meeting is to be held in March with the hope of setting up a Compassionate Friends support group in Stanthorpe. 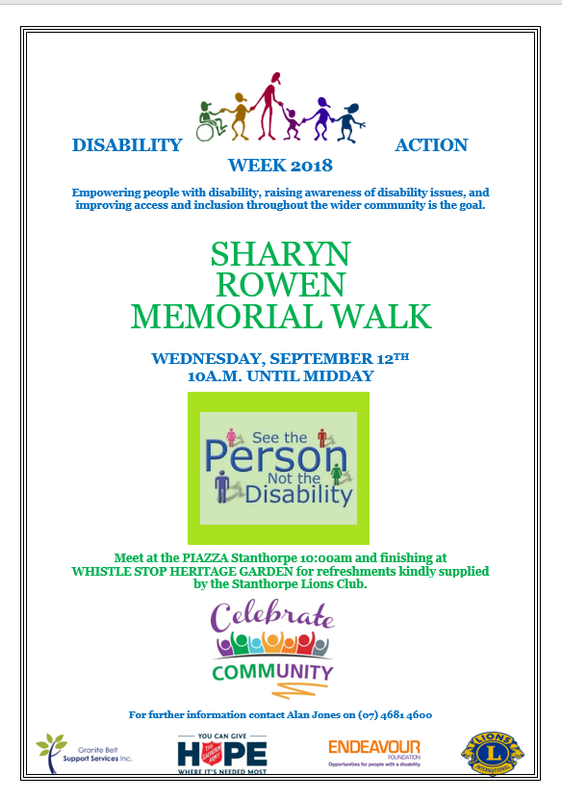 The Sharyn Rowen Memorial Walk will be held on Wednesday 13 September from 10am until midday, starting at the Piazza and finishing at the Whistlestop Heritage Garden for refreshments. GBSS wins Health and Community Services Business of the Year award. Do you want to make a difference in someone’s life? Do you want to have variety in your work? Do you like social contact and working in a team? Do you like to have fun in your work? GBSS is a supportive, inclusive and flexible workplace for staff. You would be working with people of all ages, with a variety of disabilities. Our Therapy Team member Lisa Notley – Occupational Therapist had some great family feedback.